UCView is proud to announce the release of an innovative On-Demand IPTV Solution! IPTV allows you to broadcast live feed from any multicast server and watch Sports games, live TV and On–Demand content from any smart TV. Users can request any content using a remote control, a customized menu for each screen or to be centrally controlled from the Server. Our IPTV solution is ideal for sports arenas, educational institutions, hotels, medical facilities and all public locations. Traditionally, the definition of IPTV referred to Internet Protocol television that is distributed over an Internet Protocol (IP) network. 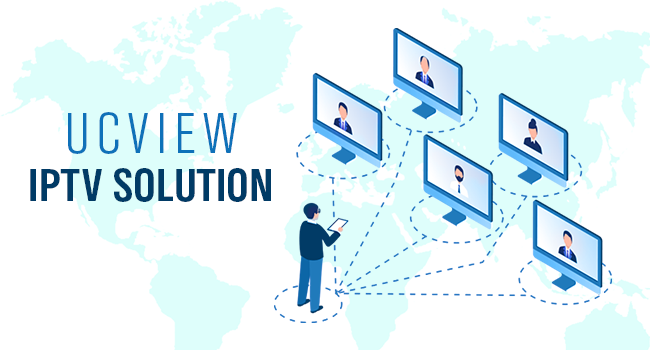 UCView takes this concept a few steps further enabling you to go beyond just streaming live programs. Harness the power of RSS and social media feeds, live weather updates, stock information and over 100 other signage apps that can be used as On-Demand dynamic content. In addition, you can use our ecosystem to allow your customers to access coax channels, complete room check outs, view training videos, find local attractions and more - all done through easy-to-use interactive TV menus. Designed for enterprise networks, UCView IPTV solution has unrivaled flexibility and scalability. Added security and encryption is provided through integration of LDAP, Active Directory and DRM technologies such as Samsung Lynk and other encryption standards. UCView easily integrates with a variety of today’s SMART TVs providing on-the-fly content scheduling. Specifically, Samsung Tizen displays. Turn any Samsung SOC TV into an interactive IPTV and on-Demand content delivery system without the need for a cable box. Bring content to each screen with a click of a button. Switch between IPTV content to recorded video, images, custom HTML5 content using standard remote control TV - no extra hardware is required.